Convert corrupted/Orphaned/Inaccessible OST file to PST file. Complete conversion of mailbox including email, calendars, contacts, tasks etc. Convert any size OST file to PST file – No 2GB Restriction. Recovers your deleted data items from OST file. Enable you to convert OST into other formats also like EML and MSG. MS Outlook must be installed in the system for conversion. This OST Converter tool can export offline ost to pst file easily and also provide a mechanism to save OST file into other email formats like MSG and EML as per the user requirements. OST converter software has the capability to transfer ost file to pst file even if the OST file is highly corrupted, Inaccessible, Orphaned or Unusable, Offline or cannot be recognized by Outlook. With the help of OST converter tool you will be able to see the preview of all OST file components after recovery that includes: Emails, Contacts, Calendars, Notes, Tasks, journals etc. Also this preview shows the number of items associated with each component. Exchange OST to PST conversion software manage to move data from ost to pst by not affecting the Meta Data like Cc, Bcc, to, sent date, receive date etc. and attachments associated with e-mails. This information remains same as original in OST file. From a complete OST file structure you can select specific data items (files and folder) that you want to export into PST file by marking the respective checkbox. This software only export the data which has been selected by the user. During the process of OST to PST file conversion, OST Converter software will maintain the internal structure or hierarchy of OST file in PST file. No changes will be performed on the structure of OST file. When you are using Microsoft exchange server account and you have selected cached exchange mode or work offline mode with MS outlook, an implicit offline data file (.ost) is created on your system that enable you to work in offline mode when you are not connected to exchange sever. 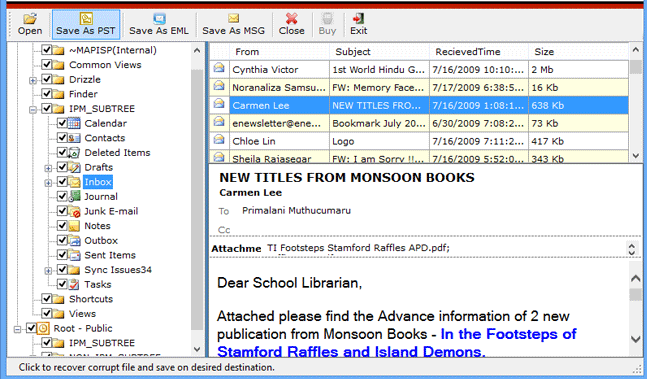 MS outlook stores e-mails messages, contacts, address book, tasks and other data on your computer in Outlook data files. 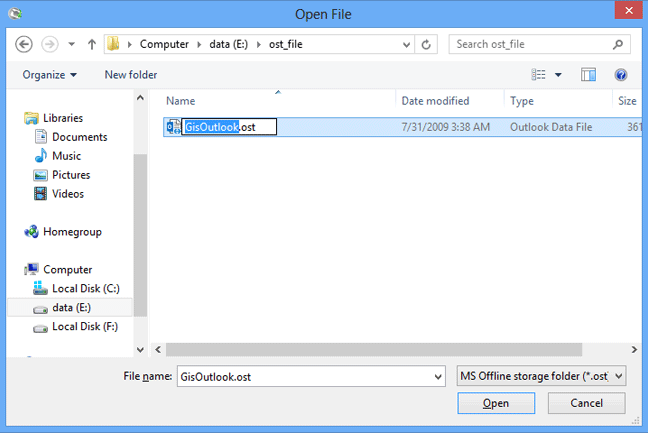 Outlook offline data file (.ost) contains copy of exchange mailbox data items which will be synchronized with exchange server when it is connected to it. All the updates on offline folder get reflected in exchange mailbox as soon as it is connected to the exchange server. You can easily locate outlook data files on your system irrespective of any version of MS office you are using by simply executing this "%LOCALAPPDATA%\Microsoft\Outlook\" RUN command. When OST file gets damaged or corrupted by the attack of malicious programs like virus or worms. When your mailbox is deleted accidently from exchange server and you need to access some important mails or other data. When issue arises in synchronization of OST file with exchange server and the data is not updating with exchange server mailbox. When you want to carry important business mails from one organization to other business place. 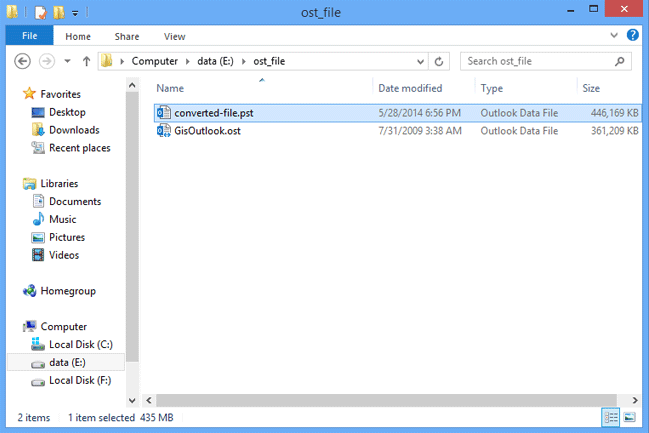 There are two possible best methods to convert Outlook OST to PST. 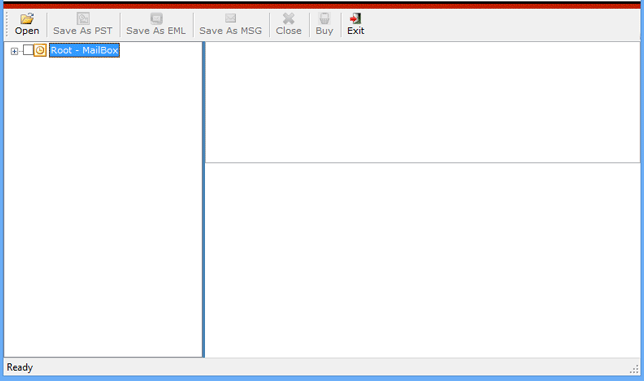 First one is using MS outlook export and import option available in file menu. This method will convert a healthy OST file into PST, healthy means your OST file must be successfully opens with MS outlook. Only then you can able to export data from OST file to PST. Other method to export OST to PST is converting it with "Intrigua Convert OST" software when the OST file is corrupted, damaged, inaccessible or orphaned and facing issues in synchronizing with exchange server. This software can export highly corrupted OST file easily with recovering all the data items of OST file into PST. You can convert any size OST file and also recover all metadata plus attachments, deleted files or emails easily using Convert OST tool. Step 1: Download and Launch the OST Converter software on your system. Step 2: Locate OST file from your system. Step 3: After OST file scanning process, complete OST file strructure will be displayed. Convert OST online video is prepared for the customers so that they can quickly assimilate with software functions. Watch live Convert OST video to get to know about its features and its working methodology. Which version of MS Outlook does the software support? Convert OST software supports MS Outlook versions 2013, 2010, 2007, 2003, 2002 and 2000. Is this software can export highly corrupted OST file? Yes. You can export OST file into PST even if the OST file is highly corrupted. Does this software run on latest version of Windows? Yes this software can run and install on latest version of windows as it does not have any compatibility issue for windows version. Is it necessary to have exchange server environment to convert ost file? No, exchange server environment is not required for this conversion. Only you need to have outlook installed on your system and configured with POP3 or dummy account. How much time does it takes for conversion? As our organization is very big including thousands of employees and having Exchange server environment to communicate but due to the sudden corruption of data in database leads our OST file orphaned. 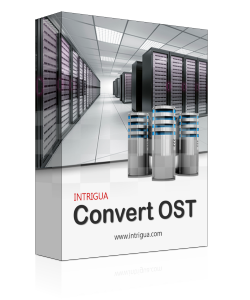 Then I came to Know about Intrigua Convert OST software that help us a lot in exporting crucial data stored in OST file to PST file. Few months ago, MS outlook showed me an error that your OST file is not recognized by outlook and that file contain important information, I have tried a lot to resolve this, but everything were failed then I searched online for a tool and I found Intrigua Convert OST file to PST file software most appropriate that enable me to migrate all data from OST file to PST file in just a few seconds.